We reminisce about our fledgling days in the world of web and design with our stories of first jobs in the industry. As much as it feels like we’ve been at this forever, everyone has to start somewhere. 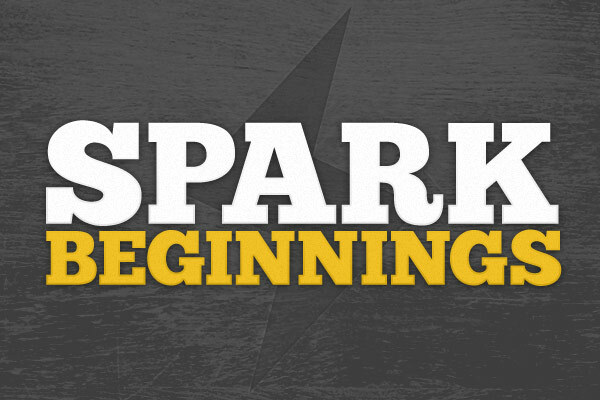 From both humble and exhausting starts the Sparkbox team has emerged. In this post, we’re taking a long trip down memory lane (to the very beginning) to remember our “big breaks” into the industry. My first job working on the web was with LexisNexis during college. I started out working on J2EE applications for a global news and business application. Everything I had worked on up to that point had been C++, and I had never done any Java before. They let me dive right in. Working at LexisNexis was something I had wanted to do since I decided to go into computer science in middle school. It was THE place for a software engineer to work in Dayton, OH. I had what I thought was my dream job as my very first professional position. I spent the first couple years working around the clock. The more that I worked, the more that I learned; the more that I learned, the more they let me do. Over the next six years, I was given work in almost every facet. I was able to work with senior professionals who became my mentors, and I met others that have become some of my best friends. Although I eventually decided it was time to leave, I look back at my time at LexisNexis fondly. I would not be where I am today without my time there. My first job in design was with Design Forum (now Interbrand Design Forum). After my Senior year at Purdue, I sent an email simply asking to whom I should send my resume. My portfolio website (Flash intro, baby) was in the footer, and it evidently caught someone’s eye. I received a call later that day to come in for an interview. I was so in awe of Design Forum and their awesome client list, I went into the interview completely relaxed as I was sure I had no chance of working with them. I just wanted to see their cool office. To my amazement, I got an offer within an hour of leaving the interview. I moved to Ohio from Indiana less than a week later and was working within the next few days. Working at Design Forum formed me and my work habits like no other job I’ve had. I really had no idea what I was getting myself into. The sort of design work we did was completely unique. Retail environmental design isn’t something you get much prep for in school; however, I had a fantastic mentor. I came away with habits such as demanding high expectations of my work, honoring project deadlines, blowing away clients, and surviving on minimal sleep. My record was a 26-hour day. Yes, it is somehow possible. For me, my first web design job was actually the first company I started: Design District. At the time, I was heavily involved in the short film community. A couple of my buddies and I got the idea to start a design and video shop and get paid to do the things we loved. I have a background in software development and audio engineering, so I handled audio on location and did all of our audio post work. We were approached by another freelancer with a client that needed a website. I have a B.S. in Computer Science, so we jumped at the chance. I eventually bought my partners out and ran Design District as a sole proprietorship for several years. Then I met my current partners. And here we are four years later. My first design job was in 1989 at Bingenheimer Design (now Bing Design) in Yellow Springs. I was hired to handle all production for three corporate magazines: ProHealth, Alpha (NCR), and Growing Together (Children’s Medical Center). I also handled the Cityfolk account which included everything from account management, to design, to press checks. The highs and lows of my time there came in the same event. Bob Bingenheimer, the owner and only other full-time designer, left for a three week vacation when I hadn’t even been there a year. I had to handle all of my accounts as well as his. I worked myself sick; but upon his return, he told me that it was the first time nothing blew up while he was on vacation since he owned the business. My first job was an internship with Real Art Design Group in Dayton. I was really fortunate to get the position as it was pretty competitive among my fellow students. I remember being so nervous in the position, and I know I bugged my manager to death. I was also fortunate that Real Art hired me full-time in the summer of 2001 after my graduation. It was a great place to start my career, and I ended up working there a total of seven years. The high point of the job was the immense amount of learning through collaboration with other very talented people. I enjoyed the casual, fun atmosphere and working on great projects. The low points were the frequent long hours, but I was young and motivated. I remember that I once worked until 4AM, then drove straight to Detroit to deliver some work. Fun, blurry-eyed memories. This is a quick story, as I don’t like to dwell on these memories. It was in the winter of 2002. Cold. Dark. The wind howled outside my bedroom window. Lazing about as I always did back in those days, my Internet browsing experience was interrupted by an ominous creak rising from the stair down the hall. As my stepdad walked into my room, I swiveled in my chair to face him. “I want you to design a website for me,” he said flatly. I nodded, waiting for him to give me more details. He was asked by the Ohio River Hunting Retriever Club to have me design their website. I had no idea why they chose me. He must have let them know that I was “into computers” and “was working on a computer science degree” at the time. I suppose that meant I was qualified to design a website. I told him I would do it. I made something that I shouldn’t have. It was awful. It was coded in Adobe GoLive. It was awful. Never mind – I don’t want to talk about it anymore.